point areas of your garden. They can be left outdoors all year round. YOUR GARDEN GROT CAN HELP YOU THIS HALLOWEEN! 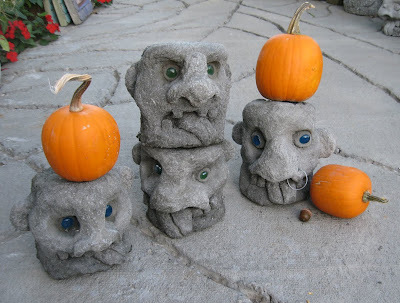 If you made a GROT, (gnarly garden gnome) in one of our HYPERTUFA STUDIOS, you can use it in your Halloween decorating this year. Include it among the pumpkins on your porch. It can also serve as a perfect jack-o-lantern stand. We won't have to try hard to remember this kind of September- I'll take this weather any time-comfortable temperatures and plenty of rainfall. 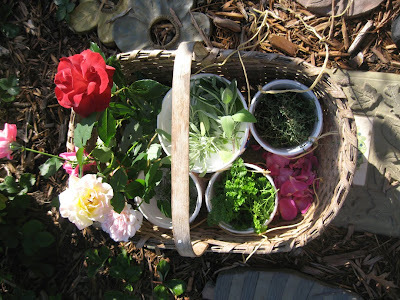 Laurie's collection basket shows the rich, vibrant colors of the day and these are still in the summer color palette. 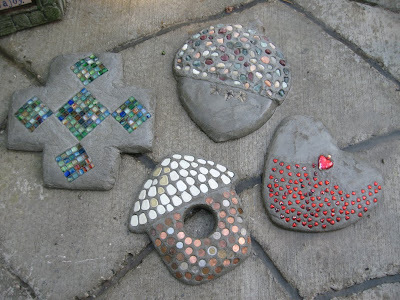 The last HYPERTUFA STUDIO of the year had very sharp stepping stone makers. 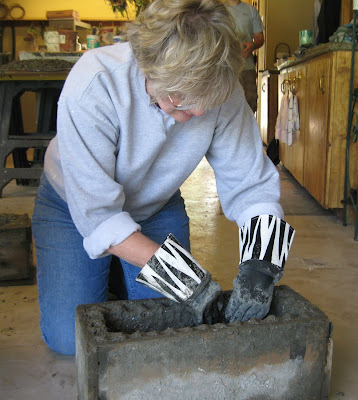 They created original designs by hand forming concrete following the lines of their initial sketches. 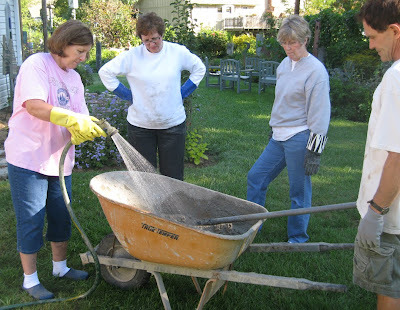 How many gardeners does it take to mix a bag of concrete? 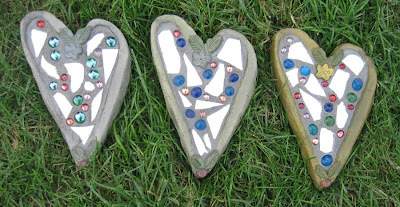 Kathleen created a heart-shaped stone and decorated it with smaller glass hearts. 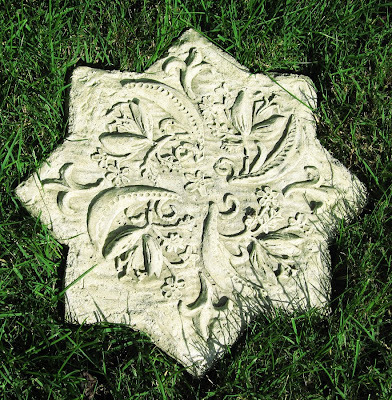 ornament her cross stepping stone. 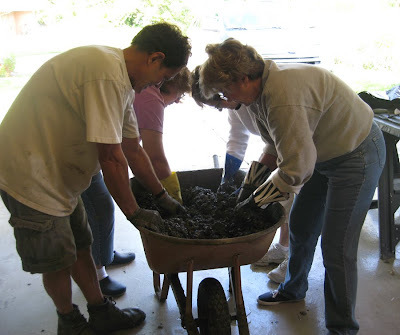 As the first step in making my "green" version of HYPERTUFA, the shredded paper must be thoroughly mixed to a pulp. This process can be very therapeutic! ...almost pretty enough to eat! 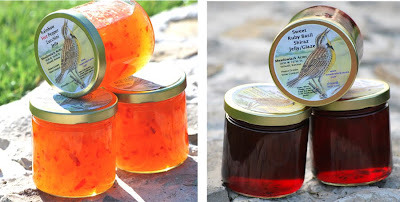 MEADOWLARK ACRES- Fresh, garden in a jar! 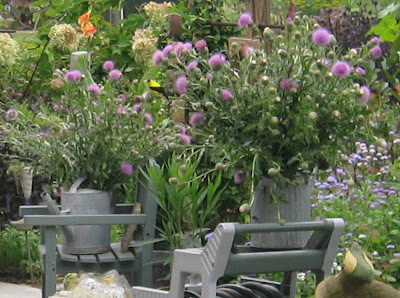 Suzanne Frisse, owner of Meadowlark Acres, has been gardening in Stilwell, Kansas for over 20 years. She has over 36 beds that produce veggies, herbs and flowers for her local home market store. 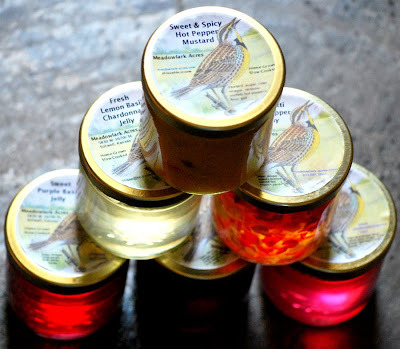 The jellies, mustards, relishes, chutneys and herbal soaps are all natural, 100% vegan and made with her fresh picked garden produce. 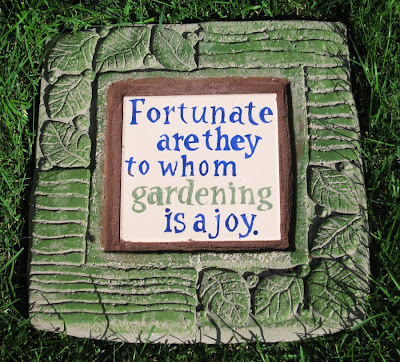 She raises her plants from seed in the greenhouse and is always trying new varieties of vegetables and flowers. 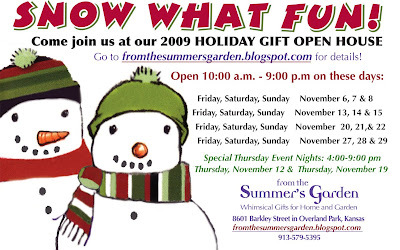 Her gardens and market store are open during the summer from 8am to 7pm. 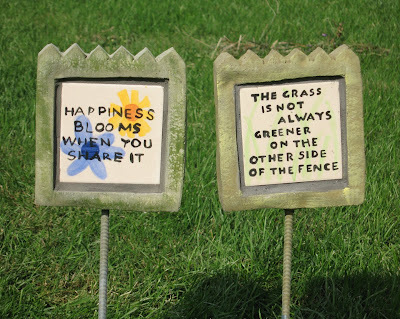 The Totem Garden Stake Collection allows you to build your own custom totem stake to best fit your needs. Select the icon shapes you like and put them together on a stand- it is that simple! 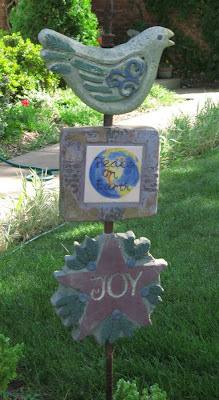 This Totem Stake uses three icon shapes on a ground stand. This one uses five icon shapes on a concrete base stand. 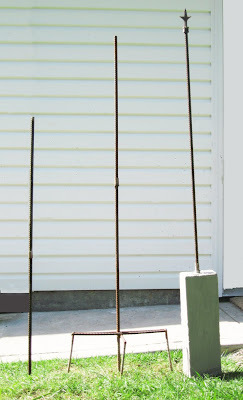 Select from three types of stands: a simple rebar stake with a fixed stop, the ground stand and the cement base stand with top finial. CLICK HERE to see the icon shapes available. 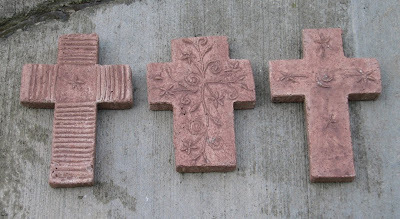 Three coordinated cross plaques available in red (shown), green and gold. 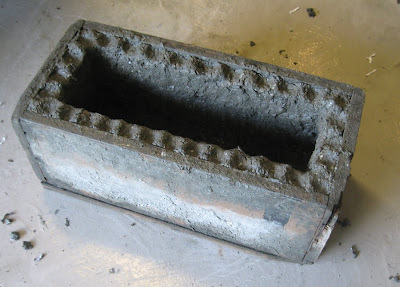 These are made of concrete so they can work inside or out. 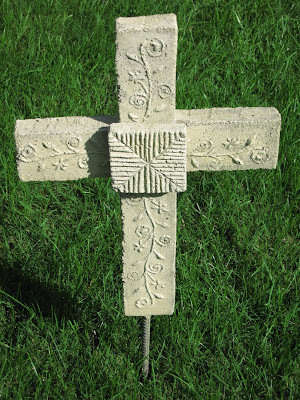 This cross is larger and is available as a short stake for outside or with a hook to hang either inside or out. Available in red, green and gold stain over white washed concrete. The cross above is colored with the green stain. Lauren’s handmade memory books are designed to feature milestone events and bring those special moments together in one expandable book. Each book holds 4 large square photos and 12 smaller triangular photos - plenty of room for display of your favorite event without putting your viewer to sleep! 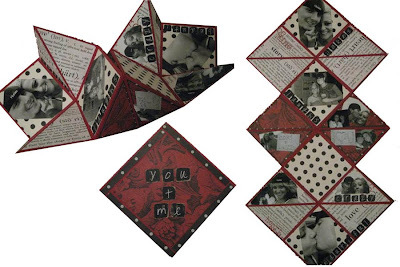 These books are perfect for displaying small compilations such as a Christmas cocktail party, a surprise birthday party, wedding shower or a Fourth of July picnic. 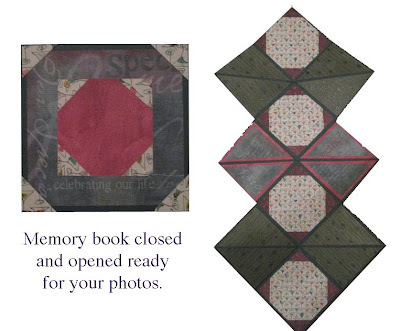 Use these memory books as decorative accents on a coffee table or display them open as wall décor. 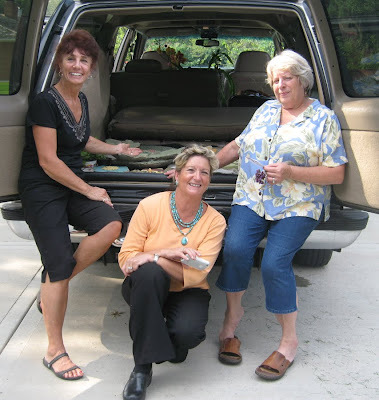 Linda brought JoAnne and Kathy over today and they had a heyday going through the garden selecting this and that to take back to Colorado for their own gardens. 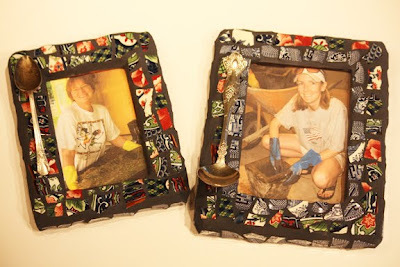 It is a good thing Linda is an expert packer because she packed up quite a load of concrete treasures. Our gardens are in a state of transition from late summer to early fall. Clean-up has begun and some of us already have replaced burnt out annuals with fresh pansies. I mean to do this one of these days. Cooler weather and the wonderful rains have deepened the color in almost every flower. 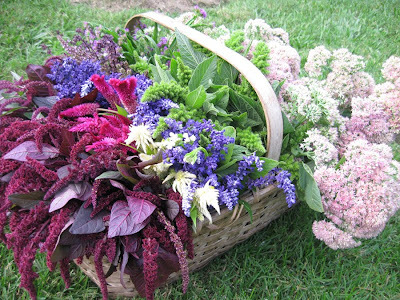 Just look at the richness of color in this basket of flowers picked for drying. We'll use these and other herbs to make our wreaths for sale at the Holiday Gift Open House. Combinations of old and new, near and far …each piece has a unique story to tell. 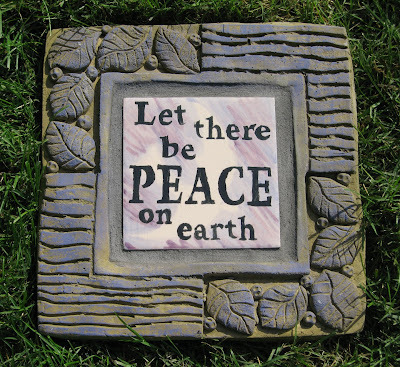 Made of every possible material and origin, representing many generations and continents of the world. Sometimes, components come from a 'previously appreciated' piece with a mysterious past life of its own. The stories are strung together, in more ways than one: your purchase will bring you into the loop. To foster creative energy and pay homage to a legacy of craft around the world, proceeds will contribute to Kiva micro-loans - investing in artisan entrepreneurs in developing countries. Full circle...with a lovely little clasp. Laurie and I were about to take our bikes out for an early morning ride and discovered four goldfinches furiously feeding on a bouquet of cardoon blossoms. Of course, by the time I got the camera, only one bird was left. It was fascinating to see them rip apart the thistle blossoms to get to the tasty seed. The complimentary colors of yellow and purple were vivid. 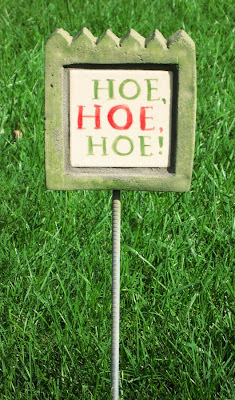 ...and so does this four-foot Hoe, Hoe, Hoe Stake! 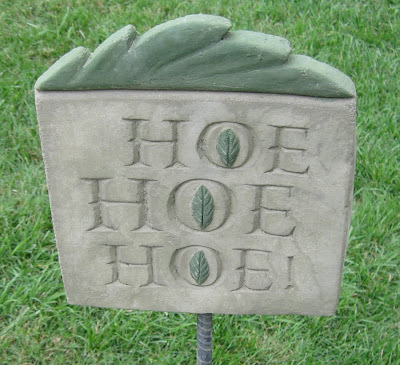 They'll make a great holiday gift for any gardener too! After retiring from his everyday job, Tom discovered a fascination with stained glass. 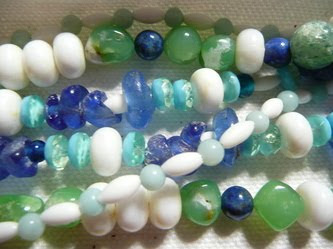 He took several training courses and learned how to cut glass and join pieces together. 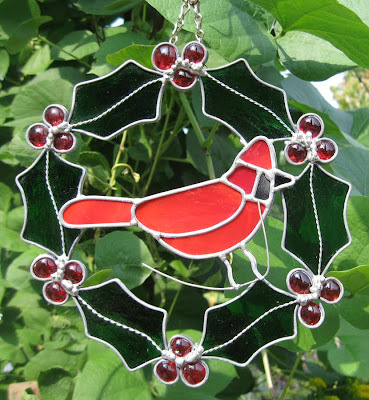 Practice makes perfect and many sheets of glass later, you'll find a broad selection of sparkling stained glass gifts for both inside and outside your home. 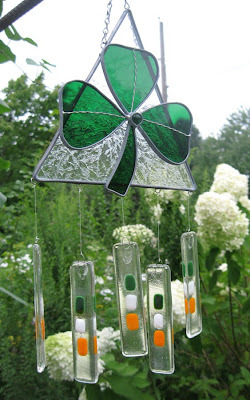 Newest to his collection are stained glass wind chimes. 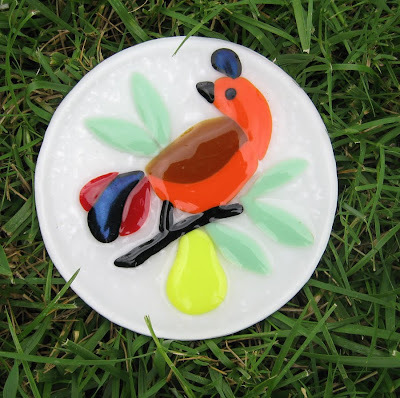 Tom has also introduced pieces made of fused glass. JUST LOOK AT THIS EXCITING LINEUP OF ARTISTS! CLICK on the artist's names in red to see examples of their work. 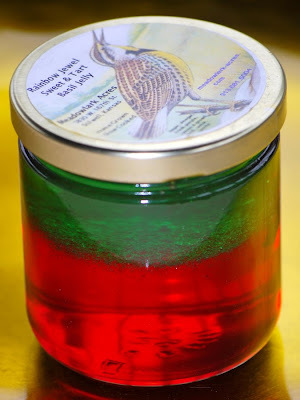 Meadowlark Acres - Fresh, Garden in a Jar! 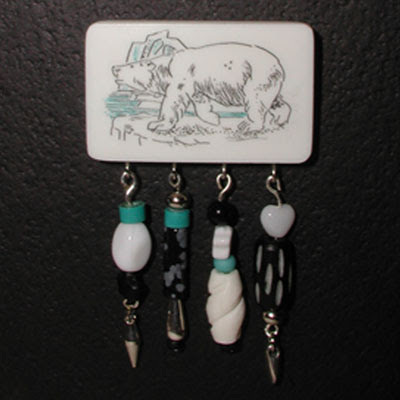 Teede began designing jewelry in 1990. 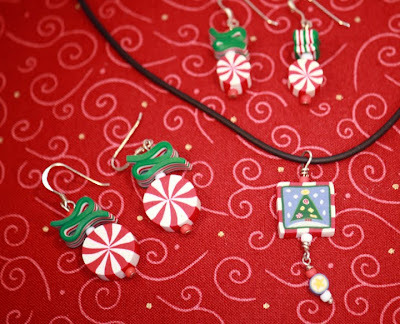 Her jewelry has been featured at The Nelson Atkins Museum of Art and The Nerman Museum of Contemporary Art. 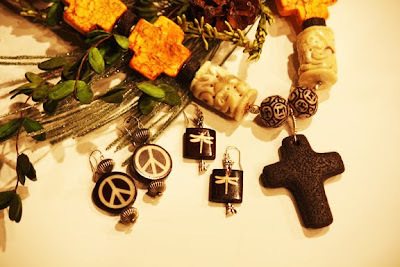 Teede's eclectic jewelry appeals to women of all ages. Designs range from sophisticated to whimsical. 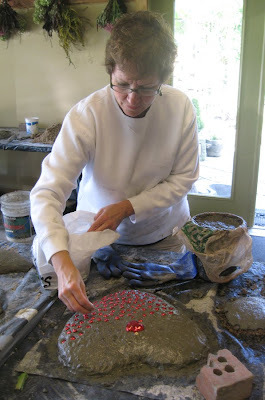 Her love of color and texture led her to explore working in mosaics. 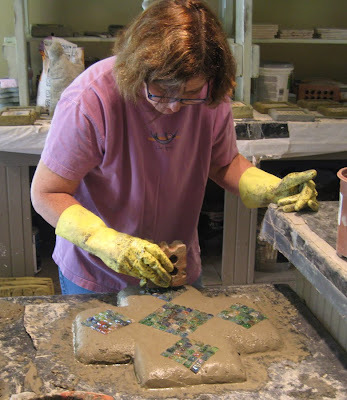 Her unconventional mosaics have received acclaim in area art galleries. 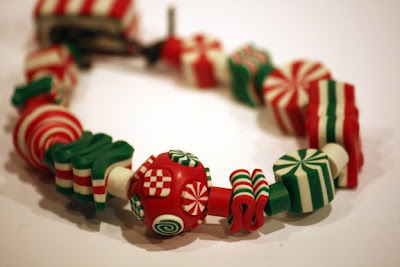 Karen Skillett is a jewelry artist who uses polymer clay to create her unique designs. 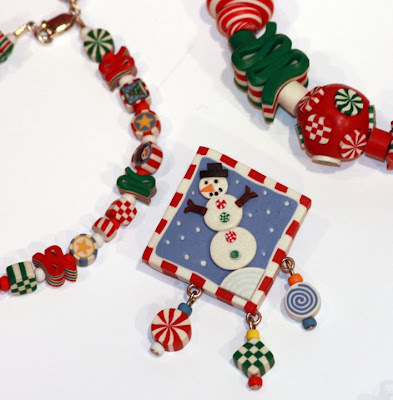 Karen incorporates her polymer clay beads with ceramic and crystal beads. 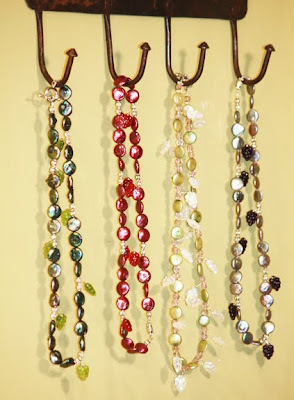 Each piece of jewelry is one-of-a-kind and made entirely by hand. 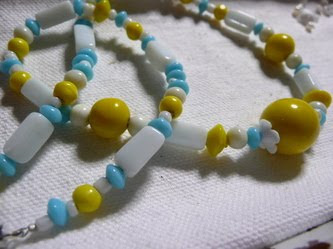 The technique used for her beads is millefiore, the same method developed in Venice, Italy in the 11th century to make glass beads. 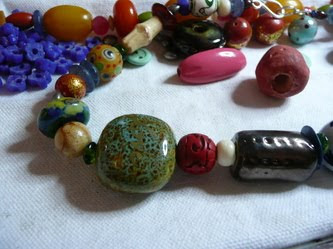 Different colors of clay are hand mixed, then layered and pieced together to create an intricate loaf or “cane”. 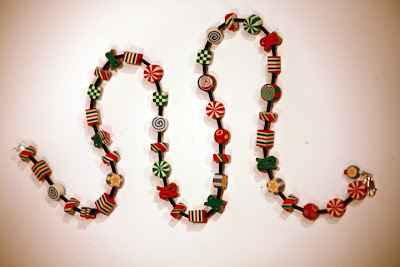 These canes are then sliced crosswise and combined into detailed miniature sculptures and beads. Finally, all finished jewelry is heated to become permanently hard. 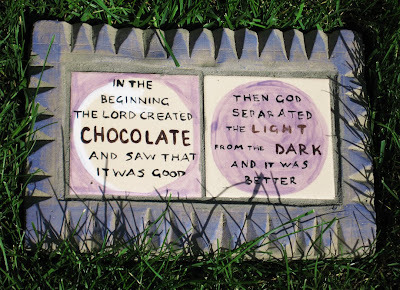 The resulting work of art is durable, light-weight, and colorfast. Judy has worked professionally as an event caricature artist for 23 years. Five years ago she started sculpting, taking her caricatures 3-D. 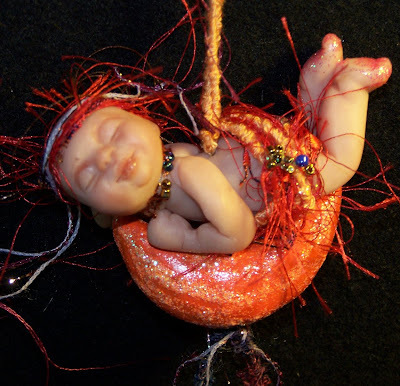 Since that time, she has done several caricature dolls that are fully posable. 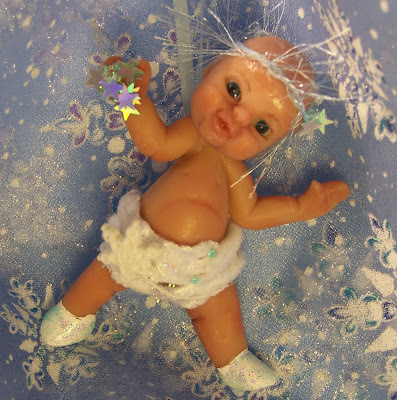 A few months ago she created the Diaper Doodles, funny little caricatures of babies that can hang as an ornament to be used for decorations or gifts. 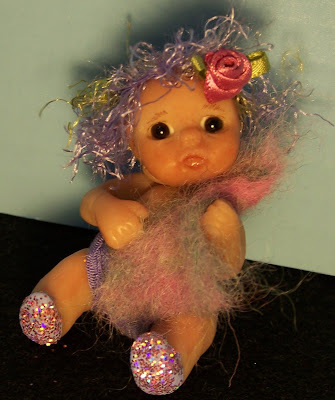 They are fun and funny but the best part is very affordable, making OOAK (one of a kind) sculpture available to everyone. 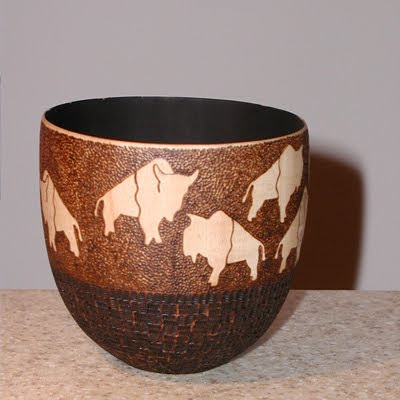 Vickie’s interest in art, nature, and her love for animals have drawn her to explore many art forms and media such as Scrimshaw, Beading, Pine Needle baskets and her newest obsession, woodburning known as Pyrography. 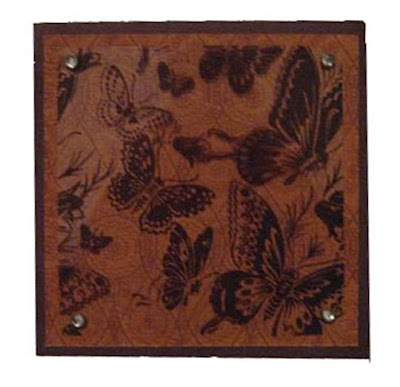 Vickie has done several collaborative pieces with Judy Chesnut to embellish her turned wood pieces and in the process became interested in the technique. 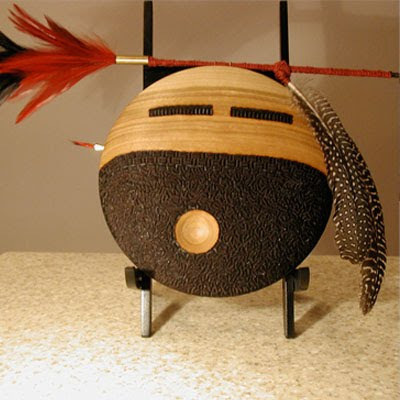 She has exhibited collaborative pieces in the Nerman Museum of Contemporary Art and also in three American Association of Woodturners National Symposiums.